Basements and moisture go together like chocolate and peanut butter. In a poorly ventilated space, a little moisture in the air can lead to serious problems. And, when you’ve finally had enough of that musty basement odor the search for a dehumidifier begins. To make life easier and to help you find the perfect basement dehumidifier faster, we went out and did the heavy lifting. We found an awesome dehumidifier at a great price point. It’s Frigidaire’s FFAD7033R1 and it will dry and maintain basement air humidity levels. In the world of dehumidifiers, Frigidaire’s 70-Pint unit reigns supreme. It’s built like a tank, always in-stock, and provides incredibly user-friendly controls. 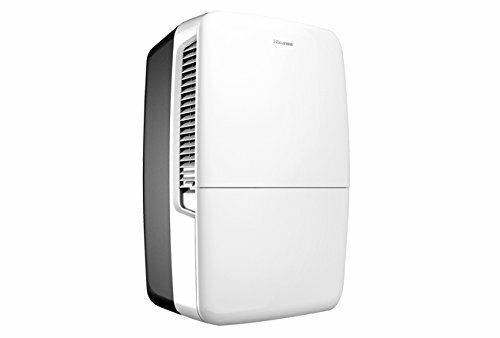 The Frigidaire is easy to move, empty, and it’s by far the quietest dehumidifier we’ve found. It’s a great value and doesn’t skimp on performance; you can’t go wrong with this one. Read more about this awesome dehumidifier below. Keystone’s 70-pint humidifier is great but there are just a few things that make it inferior to the Frigidaire model. None of these things affect performance. But, they were significant enough to make our decision easy. However, the Keystone will save you about thirty dollars over the Frigidaire. This is another great unit, but like the Keystone, it just doesn’t have all of the extras we came to love in Frigidaire’s dehumidifier. It is the only machine that we’ll recommend if a built-in pump is a must have. 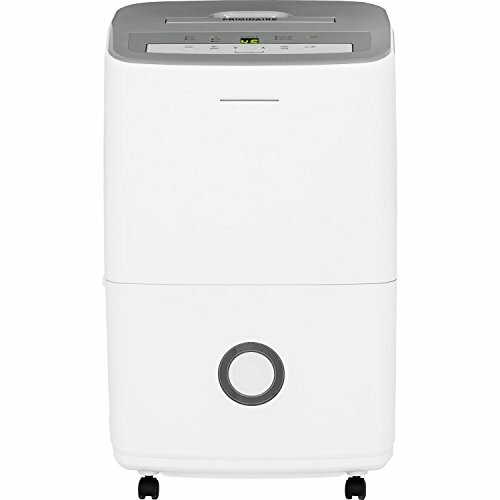 We also think this dehumidifier has the sleekest appearance. It’s not as stout as the Frigidaire, but it does avoid the “fancy paper shredder” appearance of the 70-pint favorite. It’s also the most expensive option that we really liked. Do you need a built-in pump? The short answer; no you do not need a pump. Most of the units we’ve encountered (with built-in pumps) have pretty significant drawbacks when compared to their non-pump counterparts. Plus, for most consumers emptying the water every so often isn’t a deal breaker. And, with a 70-pint unit, you should not be overwhelmed by trips to the basement. Furthermore, there are quite a few basements out there with a built-in drain. So as long as you choose a model that allows you to connect a hose to the machine; a pump might be useless anyway. But, if you still insist on using a pump to lift collected water out of your basement we recommend a separate device. With a length of inexpensive plastic tubing and a condensate pump, you can have the best of both worlds. A top of the line dehumidifier, and fewer trips to empty your units water basin. In many of our guides, we recommend sizing a purifier to a room. We also advocate considering your needs carefully before you submit that order. However, when it comes to basement dehumidification we say “Go Big!” Buy the largest unit you can afford. Why would we urge you to forgo careful consideration and calculation? Because you want to get rid of humidity. Period. In most cases, a 70-pint unit will remove moisture faster than a smaller sized option. And, since we’re talking basements here… we want to remove water from the air as quickly as possible. Basements are a hotbed for moisture and mold problems. So the calculation that really matters is how much dehumidifier can I afford. Who Benefits from a Basement Dehumidifier? If you have an extreme basement problem don’t expect that a dehumidifier is the ultimate solution. We’ll be the first to tell you that even the best dehumidifier is not a cure-all for overly humid basements. First, Mother Nature provides the greatest impact on humidity. Season and geographic location create more relative humidity swings than any dehumidifier can overcome. Another thing we need to point out is that if you have an underlying problem with drainage or your foundation; a dehumidifier will not help. Well, to be completely frank it won’t help over the long term. They can, however, minimize damage and keep repair expenses under control while you save money or wait on a contractor. Or, as is the case with some renters… while you wait for a landlord to approve repairs. Prevent damage to wood furniture, trim, etc. So without going into too much detail or analysis… a dehumidifier is for anyone with a basement that has greater than 50 percent relative humidity. Typically you will be able to trace basement moisture problems to excess water in the soil surrounding your home’s foundation. One of the cheapest and easiest improvements you can make is to make improvements to gutters. First, reroute your downspouts away from your foundation. Next, make sure your gutters are clean and draining properly. Those two things should improve things significantly. Another common source of moisture is the basement floor. If you have a dirt floor consider installing a vapor barrier. Or perhaps a concrete slab and a vapor barrier. You may also want to consider the terrain surrounding your home. Adjusting the grade or landscape features can greatly improve drainage and soil conditions. If your basement floods every time a big rain storm hits a dehumidifier is not the answer. If your walls are saturated, carpet is soaked, or your basement has standing water… you’ll need to enlist the help of specialized equipment and/or professionals. To dry out a water damaged space you’ll need powerful fans and maybe a commercial dehumidifier. Both of which can be rented in most cities. But, perhaps the best idea is to contact a professional and consult your insurance provider. What do we look for in recommended basement dehumidifiers? First of all, when it comes to keeping a basement’s humidity under control, skip desiccant dehumidifiers. They work well in certain circumstances, but a basement isn’t one of them. Don’t get us wrong we love and appreciate the little desiccant packets that come in shoe boxes and other consumer goods. But, we knew we needed something with more power. So when we went looking for the best basement dehumidifier we only considered condenser based units. And, why did we exclude thermoelectric units from our list? They’re too slow. The way they collect water (heating and cooling of specialized plates) just doesn’t collect enough water each day to take on a moist basement. And since you’re reading this guide on basement dehumidifiers… we assume you don’t have a moisture problem that a thermoelectric unit can solve. So why do we think a condenser dehumidifier is what you’re looking for? They work great at higher humidity levels and moderate temperatures typically encountered in basements. Condenser based units are awesome at temperatures in the high 60s and are very effective at bringing 65 percent relative humidity to fifty or lower. They work kind of like a refrigerator or air conditioner in that they use a compressor to circulate a specialized coolant. That coolant chills metal fins and as humid air passes water is extracted; kind of like when water droplets collect on a glass of iced tea on a warm day. The droplets of water eventually fall from the fins to be collected in a basin. What sizes did we consider? In our opinion, 50-pint units are the bottom end of what is considered effective in a typical basement. But, 70-pint units pull a lot more moisture from the air for a negligible increase in price. Thus making it the best dehumidifier for basement moisture removal. Remember, the “capacity” is a rating that references how many pints the unit pulls from the air in a 24 hour period under certain conditions. Basin capacity will vary, but most max out around two gallons. How much water it will hold isn’t a huge factor in our recommendations. Two gallons is a lot of water to pull from a basement’s air. And, if that is a common occurrence many consumers will set up a drain hose or electric pump. What features matter and what differentiates dehumidifiers? In the world of air purifiers, looks vary greatly between models and manufacturers. Some are pretty simple while others blend into almost any decor. This isn’t the case in the realm of dehumidifiers. Most are fairly similar in appearance, and looks aren’t typically a deal breaker in the basement. So what does matter? First, as we said earlier… capacity matters. You’ll want a 50 or 70-pint rated unit. Second, drainage features. If it doesn’t have a way to set up continuous drainage look elsewhere. You might not need it initially, but it’s a great feature and an excellent way to hedge against a miscalculation of how frequently you’ll empty the basin. We recommend setting up a dehumidifier in a basement location that facilitates continuous drainage. But, we’re a pretty lazy bunch. Controls, portability, and ease of use also matter. Some units are a lot easier to get up and running than others. And if you’re going to move the dehumidifier look for something with a handle and maybe some wheels. Another thing to consider is the warranty and customer service. Finally, look at the reviews on sites like Amazon.com. We, like any other review site, can only test or research so many units. And as you know sometimes you’ll get an unusually good example or other times you’ll get a lemon. Be sure to reference reviews on Amazon before buying into what any review site says. We definitely refer to them before narrowing down our choices. What doesn’t matter when choosing the best dehumidifier for basement duty? Fan noise also isn’t a dehumidifier deal breaker in our opinion. If you’re setting one up in a basement chances are you won’t be spending a ton of time hanging out around the dehumidifier. There are quieter models available, but we’ll cover that in another guide. 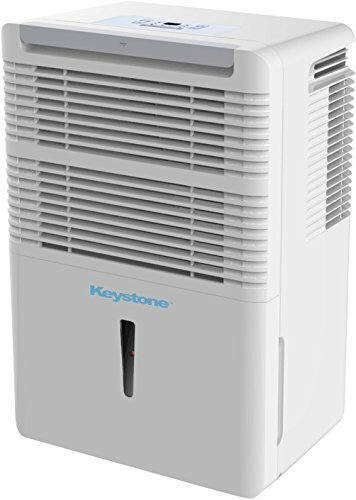 This is a great dehumidifier for anyone who needs to reign in excess humidity in a basement. Heck, it’s probably the one unit we’d recommend for any dehumidification task… regardless of location in the home. Here’s why we love it. Frigidaire’s lineup of dehumidifiers provides an excellent interface. Its controls are intuitive and much easier to use than similar units we looked at in this review. There is are two buttons that increase and decrease the humidity setting, a fan speed toggle, and obviously a power button. That’s about it. There’s “yes I cleaned the filter” button and an LED light that tells you to check the reservoir because it’s full or not fully inserted. But, when it comes to getting things up and running it’s so easy. If there’s one thing that truly sets this unit apart from the pack it’s the control panel. Well done Frigidaire. Well done. This machine is also very well built. You can feel the quality as soon as you pull it out of the box. And, if for some reason something does go wrong with this solid dehumidifier; Frigidaire as a whole provides excellent customer service and support. And, they’ve been around a lot longer than some of the lesser known brands. That definitely gives us a bit more confidence in our endorsement of this as the best basement dehumidifier. This is a quiet machine. About 51 dB on it’s highest setting. The compressor itself is all but completely silent. We don’t know why or how they do it but this unit doesn’t have that telltale noise that sounds like a refrigerator working overtime. Beyond the compressor, the rest of the unit is pretty quiet too. Frigidaire chose to locate the fan’s exhaust on the side of the machine. Masking some of the whooshing noise you’ll notice in other air moving appliances. To be completely honest the fan is the only thing you’ll hear if it’s too loud rotate the machine on its castors and point the exhaust in another direction. Not something you can do with many of the other models you’ll find. We mentioned the easy setup and controls earlier. And, it seems that ease of use was a priority elsewhere. The 13-pint reservoir is easy to extract and empty when full. And, since it weighs about 47 pounds empty we’re fans of the ability to wheel the dehumidifier around without breaking a sweat. It does have an air filter, but contrary to what some sites say this is not a dehumidifier purifier combo. The filter is treated with an anti-microbial coating, but if you really want to dehumidify and purify get a stand alone purifier to use alongside your dehumidifier. And, yes it removes moisture pretty fast. Which is kind of surprising since this unit is Energy Star Certified. Turn it on before bed and when you wake up in the morning your 70% humidity basement is probably down to about 50% relative humidity. We are confident that this dehumidifier will meet, or exceed your expectations. The Frigidaire 70-pint unit is, in fact, the best dehumidifier for basement moisture control. If you put it in a basement and it just isn’t working; consider calling a professional. you probably have an underlying problem too big for a residential grade basement dehumidifier.